Dubai is an eclectic mix of many different cultures and powerful music, art and design scenes. The city of true originality, quirkiness and traditional values – that doesn’t tend to disappoint its many visitors. As well as being huge Dubai fan I’m also very proud to call the city home. 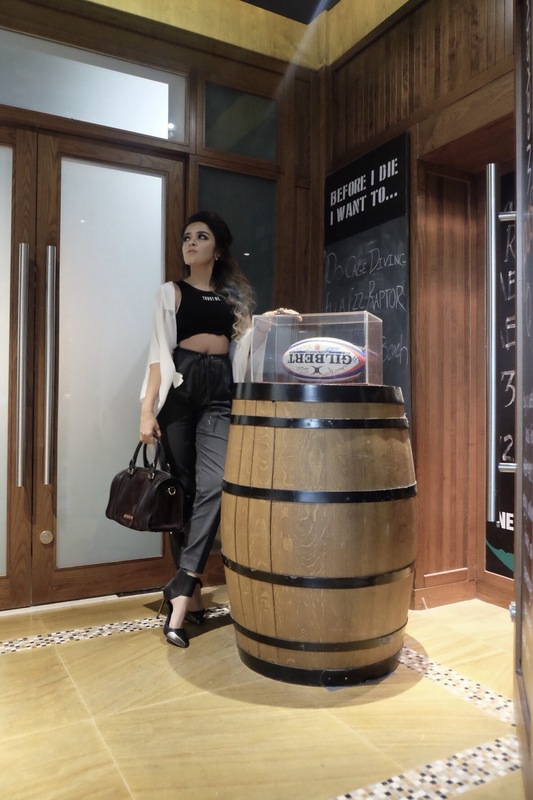 I love exploring this city and a stay-over at it’s favorite unique and trendy boutique style hotel Manzil Downtown at the heart of Downtown Dubai is to best to explore city’s Suite Life. Manzil Downtown reflect the city’s taste for the original, the extraordinary and the impeccably designed infrastructures. 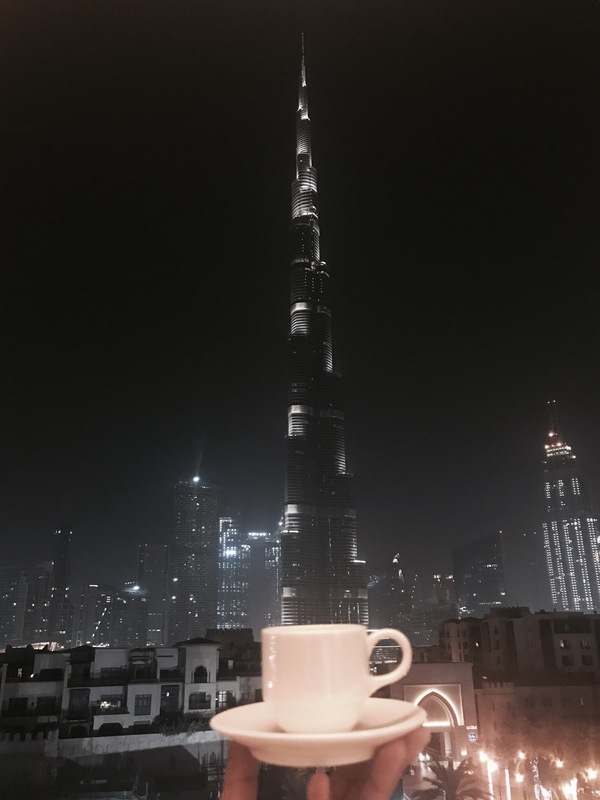 It is a hip boutique hotel which offers a sumptuous atmosphere so you can escape from all the city hassles as soon as you enter the front door, even thought its located at the center of Downtown Dubai. Little did we know we were going to have a most amazing weekend gateway when we checked-in to it’s Deluxe Burj View Room. Our early check-in was fast and friendly. The staff on duty gave us our keys and we were welcomed in the room with a personal welcome note, a plate of chocolate dipped strawberries and a gift hamper consisting of some amazing goodies. A special mention to their super attentive staff to whom I would give credit for my memorable short stay at the hotel. Classic design with a traditional Arabesque touch define the beautiful interiors of the Deluxe Burj View Room. It had a very retro modern, with lots of lashings of monochrome design. Love the details like Arabic calligraphy on the walls and Arabic interpretation of different words found all around the room. The cosy bed adds to the period glamour of the room but by far the most captivating feature of this room is the view of the spectacular Burj Khalifa. Bathroom, with a separate shower, toilet, and contemporary bathroom amenities. Complimentary Wi-Fi in the room and around the hotel. 42-inch flat screen IPTV (Internet Protocol TV). Media hub for IPTV connectivity. Hotel offers open air, temperature-controlled swimming pool is open from 7am to 7pm and makes guests feel at home, whether they’re just getting some sun or swimming laps. A state-of-the-art hotel gym is open 24 hours, making it convenient for you to work out at any time of day or night. Guest can borrow their famous ride – a vintage bicycle to explore around Downtown Dubai. Tawasal Desk is located in the lobby, complete with the latest technology and services, and supports wireless functionality, including printing. Tawasal means connect in Arabic. Open 24 hours a day, Tawasal is a self-service space, giving us the ability to work at own own pace. Hotel offer valet parking to their guests. Located a short walk away, just behind Vida Downtown, the Sheikh Zayed Bin Mansour Al Nahyan Mosque gives the guests a place of worship in close proximity to the hotel. The mosque also allows entry to non-Muslims, offering the non-Muslim guests a rare opportunity to appreciate traditional Middle Eastern architecture and Arab culture and traditions. During our stay at Manzil Downtown we have dined at the on site restaurants like Nezesaussi, Boulevard Kitchen and The Courtyard. Located at the heart of Manzil Downtown Dubai, The Courtyard is a perfect (BEST) chill out spot in Downtown Dubai. The outdoor was exceptionally beautiful with those huge chandeliers and lanterns giving us a arabesque vibes. The place was well air-conditioned too. For my surprise they serve some of the best eats to be honest. Showcasing a Middle Eastern inspired menu, highlighted by signature dishes including, prawn machboos and vegetable kebab. 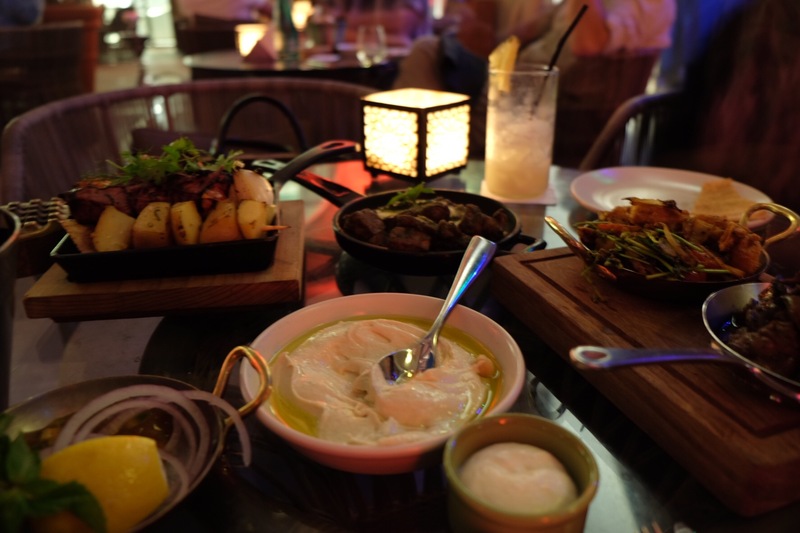 We have tried dishes likes mixed grills, cold mezze and hot mezze- everything was exceptionally good. I would consider this spot as great for laid back weekend hangouts. 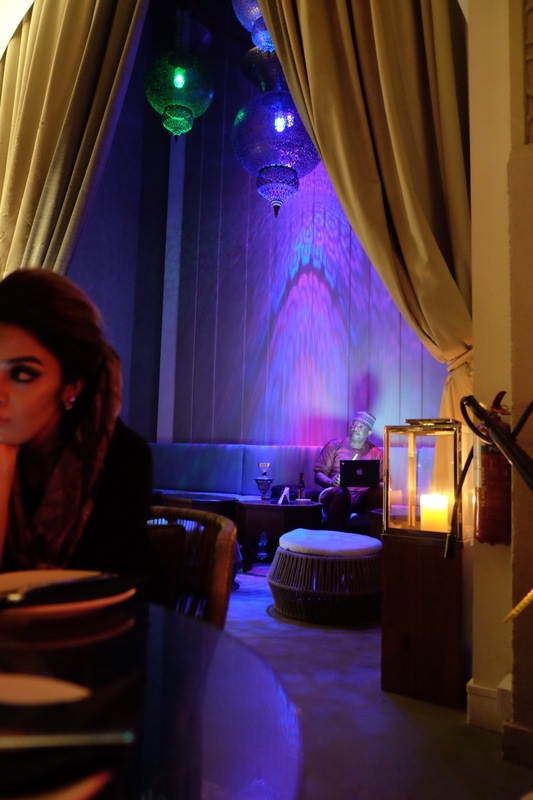 To complete the experience, it is a perfect place to enjoy their unique shisha blend based on personal preference. According to my husband, they serve the best shisha in town. I literally had to drag him out of this place. Nezesaussi is undoubtedly Downtown’s most favourite sports hub! True to its name, it offers a culinary adventure while sampling the unique food menu inspired by the tri-nations, New Zealand, South African and Australia, highlighted by signature dishes, including, Boerewors sausage rolls, ‘peri peri’ flavoured chicken wings, Beef Biltong and traditional sticky toffee cake. If you’re looking for a family friendly chilled-out Friday brunch then this is the place to be ! Their Sin Bin Brunch menu is all about British pub-grub favorites! 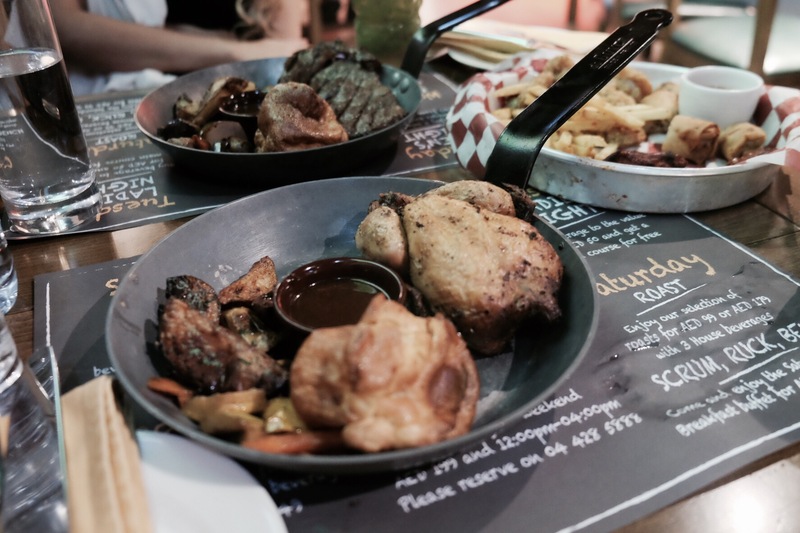 Could that be the chicken wings, or the well executed rib-eye steak served with roast potatoes, grilled veggies and Yorkshire puddings – Yum! It’s an incredible meat-eater’s Friday brunch. 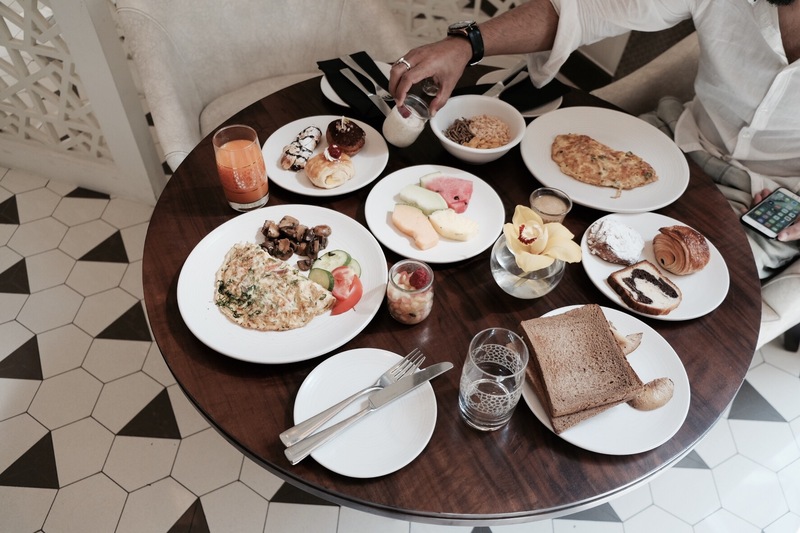 The breakfast at the hotel’s signature outlet, Boulevard Kitchen was a lavish affair with different live cooking stations showcasing incredible breakfast spread. Think of eggs, French toast, waffles, pastries, cakes, morning caffeine fix or refreshing splash from fresh juice cleanser and their attentive service that had us all happy to have left our bed. The Boulevard Kitchen truly offers a unique dining menu that incorporates traditional Arabic cuisine prepared with a modern twist, to create a diverse palette of flavors and authentic dining experiences. I fell in love with this modern boutique Dubai hotel which enjoys a prestigious location in Downtown Dubai. It’s gorgeous quirky chic decor and uniquely themed rooms which have all been charmingly inspired by Arab tradition and they showcase an astounding Arab hospitality. A perfect spot for weekend escape – a home away from home. Previous Post Fourth Edition CACHÉE Pool Party , Saadiyat Beach Club.